What was Philadelphia like when our ancestors arrived at the turn of the last century? While many Jewish immigrants arrived in Philadelphia via the Port of New York, many others came directly into the Port of Philadelphia and docked at the Washington Avenue Wharf in South Philadelphia. The Jewish establishment of Philadelphia consisted primarily of German Jews, and to a lesser extent, Marrano Jews (Jews of Spanish heritage). The Marrano community supported the elite and orthodox Mikveh Israel synagogue which is still operating at its current address, 44 N. 4th Street. Already established in Philadelphia, the Jewish community welcomed the mounting tidal wave of immigrants from Russia and eastern Europe with mixed emotions. While resident Jews did contribute financially to ameliorate the impoverished conditions of their newly arrived brethren, they were also reluctant to accept these scruffy-looking people who were poorer, less educated, and who lacked the social graces. The ballooning of the Jewish settlement in the city created the formation of Jewish "ghettos" in South Philadelphia. Whenever possible, Jewish immigrants opened shops or sold their wares from pushcarts. For other Jews, especially women, it was necessary for them to go to work in garment makers' sweatshops. These sweatshops, as well as the tenement houses where the workers lived, were often owned and operated by the Jewish establishment. The one thing that bound all Jews together in every aspect of everyday life was the Yiddish language. This was the common means of communication, even though differences in customs and mores persisted among the newly arrived immigrants and between these "greenies or greenhorns" (a derogatory description of recently arrived immigrants of any background) and the more established Jewish community. As the new immigrants became more savvy, they began to join trade unions and became activists for better working conditions, much to the chagrin of their Jewish bosses. At this time, a lively Jewish press emerged. Lectures were held at the Young Men's Hebrew Association (YMHA). Jacob Adler and Boris Thomashevsky starred at the Arch Street Jewish Theater. Once they were established in Philadelphia, many immigrants made an effort to bring over family members left behind in the old country. This need gave rise to financial institutions in the city which came to be known as Ethnic Banks. For a fee, these banks would make all travel arrangements to transport family members from their shtetl to Philadelphia. There were four of these Jewish banks in Philadelphia at the turn of the century. They were the Blitzstein Bank, the Lipschutz Bank, the Rosenbaum Bank, and the Rosenbluth Bank. Later, some of these banks grew into financial institutions rendering services which we now attribute to all banks. However, only one of these companies has survived until now. The Rosenbluth organization has become one of the largest travel agencies in America, if not the world. The immigrant Jews who came to Philadelphia toward the end of the 19th century primarily settled in sections of South Philadelphia such as the Southwark vicinity, located between 4th and 8th Streets, and from Moore Street to Oregon Avenue. At the height of Jewish immigration to Philadelphia (1900-1910), the Jewish population of South Philadelphia approached 100,000 people. Porter Street, between 4th and 8th Streets, was the "Main Street" of Jewish Philadelphia. This street was the location of many synagogues, schools, and welfare agencies. By 1920, it was estimated that 175,000 Jewish residents were concentrated within a mile radius of 6th and Porter Streets. Another important Jewish community in South Philadelphia was located on and around South Street. 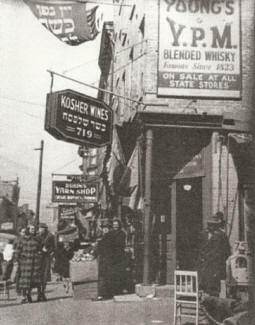 Jewish shops and professional offices occupied South Street between 4th and 8th Streets. This was an important commercial artery of Jewish Philadelphia at the beginning of the new century. Since most recently arrived immigrants lived above or behind their stores, the South Street area also had a large residential Jewish population. Other Jewish neighborhoods also began to emerge, including those in the Northern Liberties and Strawberry Mansion sections of the city. During the 1920s and 1930s, Jews began to spread beyond these neighborhoods to West Philadelphia, Logan, Wynnefield, and the Oxford Circle areas. While there was some disbursement of the Jewish population to various areas throughout Philadelphia, nevertheless, prior to the 1940s, the city was comprised of specific ethnic neighborhoods. The largest Italian community congregated in sections of South Philadelphia, where they continue to exist even today. The Greek-American neighborhood was located in the vicinity of 10th and Locust Streets; the German-Americans along north 5th Street around Berks Street, and eastern Europeans were clustered in the Northern Liberties section of the city (5th to 8th Streets between Brown and Girard.) Irish -Americans first settled along south 2nd Street ("Two Street"), where some still live. This ethnic group was the first to spread beyond their initial residential confines to become assimilated into the general population. The African-American population of Philadelphia were severely restricted to areas of South Philadelphia and to West Philadelphia, north of Market Street, until the 1950s. After WWII, the returning servicemen married and began raising families. This phenomenon gave rise to what was called the "Baby Boomer Generation." These service veterans had been exposed to mores and experiences vastly different from those of their parent. They no longer tolerated the ethnic residential restrictions imposed upon them prior to the war. These new families opted for new homes in less congested neighborhoods. Thus began the migration of these young families from the city to the suburbs. Older Jewish communities soon became depleted of their young people and eventually died out after the demise of the last remaining vestiges of the immigrant Jewish population. As synagogues, schools and stores closed in the older areas, new ones sprung up in the newly established suburban communities. Text from "Four Jewish Families in Philadelphia" by Leonard Markowitz.